With Karathress down, we only had one boss left in SSC before the great Lady, a Sartura wannabe called Leotheras. Nothing makes Morbo happier than feeling like he's playing a useful class for once (a tank) and last week's first attempts almost lead to a kill right away, with a string of classic wipes below 10%. I dare say the only tricky part of this encounter is not losing your head in the last 15%. For some reason the noble Quartz collective, faced with a boss that's 'almost dead' loses its senses completely and after trinketing and nuking and everyone getting aggro, we noticed he was at 10% with half the raid dead. Okay, so that doesn't work apparently! Who knew? The biggest challenge for any raid trying Karathress is going over all the abilities of the adds, how the pull will be made, explaining about hunter pets, totems and AE waterbolts. Once you get through that hour of your life, the fight itself is rather basic - decent dps is needed but in essence it's a good ol' fashioned tank and spank encounter. Mind you, tank and spank basically means the healers do all the work - and that's fine by me. Though killing a boss a few hours after engaging him for the first time is a little anticlimactic, I am, of course, not saying the boss is easy, but that the leadership was once again impeccable, inspirational, and most of all, insanely good looking in an orc costume. And was it just me or did Brick seem exceptionally skilled? Next up, Rutger Hauer in Blind Fury. A boss that summons endless murlocs to AE. Awesome. Everyone, and I mean everyone loves killing murlocs. I love it almost as much as sheeping ogres - but I'm keeping my fingers crossed for a future sheep-the-ogre encounter. After the resistance and enrage drama of Hydross it was nice to get to a boss that has neither. It's an endurance fight, not a nuke fight, with the only priorities really being wiping out the murlocs as they come and keeping the MT up. Of course, this near perfect encounter on paper was almost ruined by the fact that paladins - yes, you heard me - paladins are practically essential. It's bad enough that you need to have at least two locks for Magtheridon, or for clearing the trash in TK, or just to mock when they overnuke and die - but pallies? It's almost impossible to find one that isn't some 'I hate everything' reroller and even when you do find one there's a 90% chance he'll think retribution is a good spec. We happen to be blessed with a couple of active pallies - but I can see this being a problem for horde guilds who have had their pally stock ninjaed by guilds further along raidingwise. I get a little flutter myself every time I see an unguilded paladin, until I realise that you have to really mess up to be unguilded as a paladin on horde side now. Like being Dyanna. Resistance fights. Ugh. As tempted as we were to skip Hydross and head straight for the much easier Morogrim, we are an old-fashioned guild. Killing Void Reaver and Lurker before Al'ar and Hydross felt strange enough as it was - going even further and completely bypassing the intended first encounter of an instance just feels wrong somehow. So off we went, grinding primals and crafting res gear - everyone's favorite thing in the world. Of course Blizzard didn't *just* create a resistance encounter, they also added an enrage timer - another irritating feature they're throwing around now. High dps required again - at this rate we won't be able to take Trickz anywhere. With the recent removal of attunements for the Eye and SSC, we were suddenly presented with the (tempting) option to venture into Tempest Keep and take a shot at the boss that is commonly called 'Loot Reaver'. Unlike half of the raiding population of WoW I don't think attunement removal is a bad idea. Anyone that had to get an entire guild ready for Onyxia still cries a little before going to sleep and the word 'attunement' alone often leads to small involuntary convulsions and temporary blindness. The only real advantage to attunement is ensuring Trickz never sets foot in TK to ninja loot that is rightfully mine. I've said it before and I'll say it again - I really like the direction Blizzard has taken regarding raiding. Sure, we're clearing this stuff right after the nerf wave, riding comfortably along while the 'top guilds' do everything in hard mode - but in general I get the feeling encounters are much more scripted - meaning everyone has to know their job, and do their job, without that flask or purple making a lot of difference. Our adventures in SSC started with The Lurker Below, mainly due to a lack of res gear for Hydross (resistance fights? come on, Blizz, you are on the right path with most of these bosses, stop putting in resistance gear check encounters - no one likes ' em!). The fact that you have to lure this boss by fishing is great - though I've heard horror stories of people fishing for 17 minutes without getting the boss to spawn, but what pleased me the most personally was the concept of a Kraken boss. Hiding in the water, or running around in front of his spout, trying to nuke him while cramped together on a platform - it's a classic RPG encounter. I felt like I was playing Shining Force 2 again. I have to give props to Blizz for yet another fun, well-designed encounter - long as it might be. Once again Blizzard delighted and amazed the WoW population with a string of nerfs to existing content. Having spent only a little time on Magtheridon before the nerf, we were pleasantly surprised at the ease with which the trash now went down - with increased respawn time as well. Thank you, Blizzard - nothing's more irritating than getting into the swing of a fight and then having to reclear trash. Even if it only takes a short time, it's hard to refocus and pick up where you left off. We hadn't really taken any serious swings at Gruul - knowing it was the type of encounter that required not just complete focus but also an insane amount of dps (ie flasks, pots, oils and food) for the first few kills was kind of a turn off. I'm not against buffing but so far I've kind of enjoyed the laid back feel of TBC. So, slackers that we are, we patiently waited for Blizzard's nerf bat to break Gruul's back so we could pick his pockets while he was down. Last weekend the collective finally cleared Karazhan, and with the glorious demise of Nightbane a lot of repair money, reagents and pots were proven to be well spent. Karazhan, being the 'entry-level' raid instance was quite challenging, and though it was said that Maulgar wasn't the hardest raid encounter Blizzard ever designed, we went in for the first time last night not expecting any grand results. The pull, allegedly the hardest part, went flawless pretty much from the first try - and after only a few tries we started killing adds and realised purple was in the air. It's been quiet on this homepage, but most certainly not in the guild. 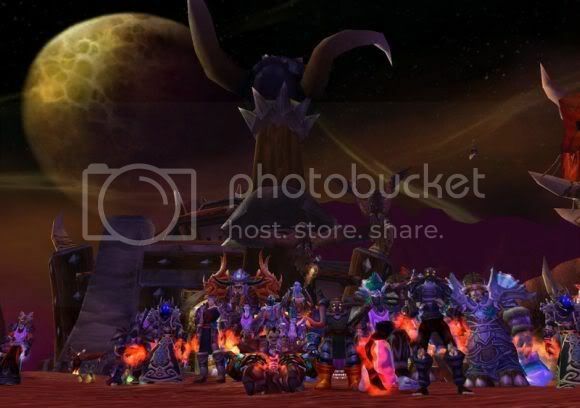 The TBC launch came right in time for many, as the old content was getting, well, old, and though PvP provided some temporary relief we were all thirsty for something new. And I know I speak for many when I say TBC gave us exactly what we'd been hoping for. Tons and tons of quests, smaller instances on varying difficulty modes, a kickstart for all professions (except engineering of course), flying mounts and outdoor PvP. This reads like a Blizzard promo pitch but hey, they did it again, credit's due. 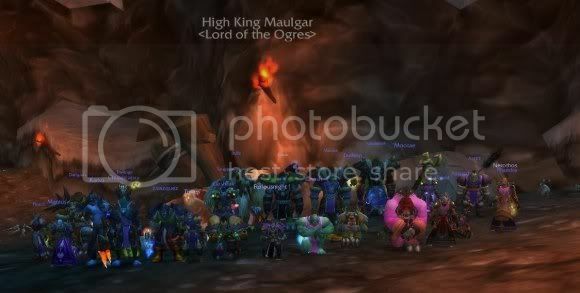 As we worked our way to 70 and tried to figure out the myriad of reputation grinds that were waiting and attunements that needed to be done, we all realised Karazhan would be our first 'larger' content and that a 10 man instance would not hold our entire guild. But this is Quartz, so we decided to just make three groups at once. And this weekend, Team Blue, Red and Green all ventured into Karazhan and slapped around the first few bosses. I can't explain how great it is to see three groups of 10 people all work together smoothly and achieve success on their own - and I thoroughly enjoy the smaller raid groups: you quickly learn what people's strengths are (and weaknesses of course - Tatertot/Darigaaz + doorway = prox aggro) and being back at the bottom of the gear list is a nice reminder of the early MC days, when we really felt like we were not supposed to be there yet. All I really want to say is: here's to a great TBC and may Karazhan completely fall to the might of the pink bunny soon. Thank you guys for sticking around and making the guild what it is.